Published on 29 June 2007. 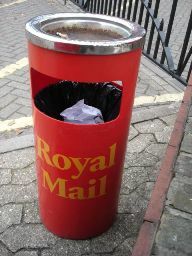 As of a few minutes ago, Royal Mail workers are on strike. In the wider context, Royal Mail is failing. It’s losing contracts left, right, and centre, and hence losing big money. To be able to compete with new firms now it has lost its monopoly, it needs to modernise, which includes sacking people and replacing them with machines. It’s been this way since the Industrial Revolution. The workers aren’t happy, and so are striking. This means that Royal Mail is perceived as unreliable, more contracts are lost, and more big money is lost. Hence, more jobs need to go. What am I missing? 1. Is Royal Mail performing? 2. Has Royal Mail increased prices? 3. Has Royal Mail ditched rural services? 4. Has Royal Mail given up completely? By my count, it’s not performing as businesses are switching away, prices have increased, and the workers appear to be giving up completely. 3 out of 4 ain’t bad – especially when you consider that this is what I thought might happen in five years, not two. This 1,166th post was filed under: Headliner. Comment posted at 15:32 on 29th June 2007. Comment posted at 01:02 on 30th June 2007. The police have found bombs in cars around London. They did not go off. If they had we would have dead and wounded to tell about. Police say the usual suspects-Muslim terrorists. The sad part is all the multitudes of decent Muslim people in the UK and the rest of Europe (and the US) are going to have to pay the price for the bad guys-who do not even represent real Islam. There is going to be less business for the small Muslim owned shops and even fewer jobs for Muslim youths as many consider all people of the Islamic faith to be terrorists. The criminal terrorists hurt their own people even more then they hurt the rest of us.When they are not killing them outright by shooting or bombing them, they cause decent Muslims to be suspect because of the criminals actions. Non Muslims are outraged and even afraid to have any Muslims around. The young Muslims are not accepted into regular mainstream society and jobs. So those people, who now feel they are hated by the Jewish and Christian world are an easy mark for the extremest terrorist recruiters who sign them up to be suicide bombers and such. And so it goes on. Why hire or befriend a young Muslim who might come back to shoot you or blow you up? Let’s be above all that this time and brng the communities together to work against the hatred which brings about the kind of people who do such terrible things. Comment posted at 04:27 on 30th June 2007. Trackback received at 04:18 on 1st July 2007. Comment posted at 00:04 on 2nd July 2007. What a waste of good cars. The terrorists are using Mercedes and top line SUV automobiles for their bombings and attacks. If I were a terrorist I would use an old Yugo or Vauxhall or even better a Renault, which would blow up without even using explosives. If they can afford these kinds of cars it points to all the good things they have as British citizens or residents. Most Muslim people came to the UK for a better life and the majority of them have it. The same is true for Muslims in most of Europe. All the terrorism has caused much anti-Islamic feeling in the western world. This is as bad as when we here in the US put everyone who had any connection to Japan in prison camps during WWII. We blamed a lot of decent people for what others they had no control over did. The Muslim community, whether it is fair or not, has to prove itself over and over under these trying circumstances. Islamic people have to not be afraid to report fellow religionists who are attempting to do bombing and killing to the UK authorities. It is not the decent Muslims who report acts or attempted acts of crime and terror who are hurting their own people. The criminals who do this kind of thing are the cause of the distrust and misunderstanding people from outside the Muslim community have about Muslims. Good Muslims do not kill people or blow up places. They have the same respect for human life as Christians and Jews. And they have the same rights AND responsibilities as every other resident of the UK and elsewhere in preventing unlawful activities in their communities. There are over a billion Muslims and only at most a few thousand terrorists. Sometimes it is hard to remember that, but we should. Comment posted at 16:01 on 3rd July 2007. Is Simon really on a study trip to Canada? Or is he at an Al Quida training camp? Is it possible the doctors at the National Health Service, as a backlash over former head Mad Pat, have entered into a terrorist plot? We have no hard facts, but rumour has it that many doctors are protesting the NHS in an unusual way. When they remove an appendix or other inner body part they replace it with explosive. The way it works is over a period of time there will be thousands of people with C4 inside them. When the doctors get pissed off enough they will press the button and the explosion will make Hiroshima look like a fire cracker. The terrorist bomb situation and arrests continue. Remember the old days when all the UK had to worry about was the IRA? Protestant and Catholic terrorists blew people up or shot and killed them, but at least it was good old boy white Europeans comiting the atrocities. It could be an all out, no holds barred fistacuffs. At least it would be better then what is going on now. Comment posted at 16:31 on 9th August 2007. Absolutely disgusted at what royalmail workers are doing to the public. They are turning the publics opinion of them from friendly posty- to greedy, selfish, inconsiderate and nasty. Having the public on your side- is always important-this was the case with the firemen when they chose to strike-putting the public-whom are innocent, at risk. This strike prevents important documents being received/sent-post is not just cards and letters. Passports, driving licences, postal orders, cheques, statements advising of payment dates, grio’s- all these things spoil the summer holidays for families if they don’t turn up- they prevent disabled people getting their money- if they don’t want it into a bank account-as many still do not. If you pay for somthing to be sent- 1st class recorded delivery- and it never arrives- as happened to me- during the last strike, you have to fill out a form and wait until the post is back to normal to get your compensation. I have no sympathy for royalmail workers- I was living with one at one point-and I am aware of how lazey alot of them are- not just my ex-but many working with him. If a union is going to be allowed to take such drastic action as they have- then the demands should be met- as the public are the only people suffering- and as it’s out of our control and nothing to do with us-we should not have to suffer! But to any postal workers out there: If I or my family ever see any of you needing any kind of help in any sort of way- forget it! Comment posted at 16:42 on 9th August 2007. I thought this was a post for royalmail strike? Mort are you insane? Use an old car to plant bombs in?! So you are condoning this insane terrorism then? Small muslim shops DO NOT suffer you strange person! I live in an area with plenty of shops owned by muslims- and I continue the same- as do the rest of the community- you cannot use any acts of terrorism or attempts of it- as an excuse to cry ‘victom!’ The only victoms are innocent UK citizens caught up in this evil and twisted war. Any one whom choses to come to the UK and live here- does so because they want to, the laws of the UK should be respected- not complained about or used as a reason to blow up people whom are doing nothing wrong but being alive! I really couldn’t care less about most of your remarks- as a person too scared to visit central london- because terrorists are so stupid they really think blowing up members of the public will mean anything to the government, the only thing the government cares about are themselves, their families and their money. It gets publicity, but only in bad light towards muslims- not towards sympathy for them or towards the western way of life. Comment posted at 17:23 on 9th August 2007. Suzie,are you really my first ex-wife? If you are married, I would love to hear from your husband. What I was trying to say was many people from all over the world, including Muslim people, go to the UK for a better way of life. In most cases, through education and hard work, they accomplish that goal. For the most part UK Muslims have nothing to do with and do not approve of terrorism. They are loyal UK citizens, as you appear to be. My comment about what kind of car to use as a place to put explosives was intended to show how some (not all) people forget all the good things they have in the UK and resort to terrorist activities.As part of my writing style I have always tried to use humour to put across a point. A new or recent Benz or Jeep cost as much or more as some third world people earn in a lifetime. Anyone who has reached a position in life where he/she can afford such vehicles should thank Moses, or Jesus, or Allah or whom ever they consider their supreme being that they live in a country where they are able to enjoy and afford such cars. In Islam, it has been explained to me by Muslim friends, a person who has been blessed by Allah with enough wisdom to become a doctor, must use his blessings to help and heal people. Under Islam he must even treat and heal his enemy if needed. Yet UK Muslim doctors are accused of involvement in the terrorist bomb plots. Human nature being what it is, as you said, you are now afraid to go into certain areas. If you do not go there you do not frequent the shops and services those neighbourhoods provide. You are not the only one who is in that situation. I am not saying your fears are not somewhat justified. But the result is that many decent Muslim small shop keepers have lost business and income because mainstream UK people tend to avoid them and their businesses, either out of fear or because they blame all Muslims. I think this is the wrong reaction. Either in the UK or here in the U.S. both the Muslim community and the general population should do more to live and work together to stop the fears and mistrust which contribute to breeding terrorists. As far as the postal strike-do you think the posties are really part of a secret terrorist plot? Perhaps if enough people start to hate them as you appear to they will become so disenfranchised from the rest of UK society they will start a terror campaign to loose all cheques and bring only bills and junk mail to your postbox. Comment posted at 18:22 on 9th August 2007.
lol, fair enough- who knows? Maybe one day the posties will become terrorists! Not entirely sure they’d be able to put together a plan- but hey. I do keep away from central london- as in the west end- yes there are plently of muslim shop keepers there- as are there many others from all different backgrounds- however- the amount of tourists will keep them in business! I was refering to local muslim shop keepers- of which no-one I see/know avoids due to their ethnic origin- the average UK person is far too lazey to travel further to do that! My point is: The terrorists ARE only causing hate against their cause, and their beleifs- and there is no other result than hate. Hate from the government, hate from the british public of other ethnic backgrounds, hate from muslims for causing such hate, and that is all. Therefore- I don’t understand what they are trying to accomplish- if it is chaos/destruction/deaths- they of course do that- but they do not in any way help their own cause- which makes absolutly no sense at all! I only came here to give my views on the royal mail strike- google brought me here- lmao! Comment posted at 18:44 on 9th August 2007. Different voices are what keeps this blog interesting. Who is this person you ask if I am a fan of? I am curious as to your amount of education, age, and such. There are so varied a group who read and respond to Simon’s blog they range from Phd. to elementary school dropout. Simon is visiting my old country, Canada. In Canada and the United States we have very little Muslim involvement in terrorism. I don’t know why it is different then it is in the UK. We are all free countries with a tradition of multiple cultures, yet for some reason the UK, and for that matter most of Europe, appears to have the most problem (outside the middle east) with radical Muslim terrorists. I have many friends in the middle east on both sides of the Arab-Israel situation. Many of them are university students. While we sometimes disagree on issues, we are as one in being against the bombings and killings. This is not what Islam is about. It is as decent a religion as any other and so are the followers. The problems are caused by a small group of people who want to go back to the fifth century. You should accept your fellow UK citizens and residents and expect them to accept you be they Christian, Jew, Muslim or anything else. And we all should respect others beliefs. Come visit us here in the U.S. when you can.